Formation of a Suburban Fire District In the spring of 1944, a devastating fire in north Gig Harbor destroyed several shore side businesses including a restaurant, a barber shop, Johnson Motors, the post office and a shipyard. Meeting in Honest John’s Café, known today as Anthony’s, John Finholm and several friends and neighbors discussed setting up a fire department. In the fall, a petition signed by 15% of the qualified voters living in the Gig Harbor community was presented to the Board of Commissioners of Pierce County asking permission to form a Fire Protection District for the Peninsula. A formal “Notice of Hearing on Petition for the Formation of a Suburban Fire District” was published for three weeks in October 1944 in the Tacoma Daily Index, a pre-News Tribune paper. Formal hearings for public comment were held, and on January 6, 1945 Pierce County Fire District 5 became a reality. Harold Rucker who helped to organize the department became the first Chief. Founding commissioners included John Finholm from Gig Harbor, Keith Swinney from Purdy and John Sails of Horsehead Bay. The first ten volunteer firefighters were Charles Summers, Roland Knapp, John Sass, Paul Alvestad, Roy Edwards, Robert Roby, John Tait, Ed Tait, Herbert Cook and Bill Miller. The First Engine: Old No. 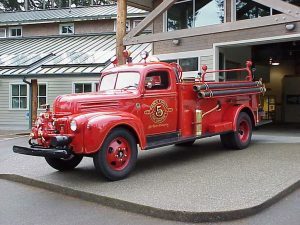 1 Being the war years, Gig Harbor Fire would have to cross some unusual hurdles to get its first fire equipment. The 1940’s were also a time of limited civilian air and sea transportation; ships and planes that did exist were contracted to the military. To get the first engine, founders of the fire department had to petition the Secretary of War to pull an ordinary truck off production lines for sale to Gig Harbor. Once approved, a 1945 Ford freight truck in olive-drab green was driven from Dearborn, Michigan to Cornelius, Oregon. E-1 became the seventh fire engine produced by Western States Fire Apparatus. Changing a freight truck into a fire engine required retrofitting with a different engine and longer drive shaft to run the front mounted fire pump. In 1995 a complete restoration of E-1 was completed after countless hours of volunteer work from a group led by Assistant Chief Stenbak, and much beloved lead department mechanic Kim Holts. Today “Old No. 1” sits in the main lobby of our administrative facility on Bujacich Road and is regularly showcased in parades and public events. Early Personal Protective Equipment The first fire station was located in the Hennington’s home garage, between Burnham Drive and Finholm’s market. To get to the fire engine, firefighters had to go through the master bedroom. Three sets of bunker gear were hanging from the fire engine, and the first firefighters to arrive got to use the gear. Personal protective equipment (PPE) consisted of heavy canvas coats. Today, this former station is the home to the Gig Harbor Yacht Club. In the 1960’s the department had one SCOTT breathing apparatus. It was kept in the Fire Chief’s car, and it was given to whoever was assigned to search the fire. Fires were fought from the outside, mostly due to limited resources. When the fire got knocked down, firefighters would go inside to take care of hot spots. Hose Carts, Bucket Brigades and Expanding Fire District Elsewhere on the Peninsula, a thriving community at Forest Beach used three hose carts for fire protection. Two of those hose carts have been restored; one is currently on display at the District Headquarters and the other is on display at Station 5-4. Fox Island, like many other parts of the United States, initially relied on bucket brigades. Ferry service connected the island to the mainland, but the ferry would not hold a fire truck. On May 17, 1956, Fire District No. 5 loaned a surplus 1942 Ford/Darley pumper to Fox Island, which had been purchased from the military in 1953. The truck was housed at the old store at the ferry landing, which was then owned and operated by Wayne Peterson and Gail McAfee. Eight years later the voters elected to become a part of District 5. In 1976-77, the Fox Island fire station was moved from next to the Nichols Community Center to its present location on 9th and Kamus. New equipment made additional space a necessity and construction was started. Living quarters were included in the construction allowing for a resident volunteer firefighter to maintain the equipment and facility. The first Fox Island volunteers included, Cecil Fassett, Harvey Powers, Thane Eckler, Capt. Ward Hunt, and Gail McAfee. Several small, two-stall fire stations were constructed over the years in Wollochet, Arletta, Purdy and Rosedale. In 1976-77, a Crescent Valley fire station was built. In 1978, a headquarters station was built on Kimball Drive to house a larger number of fire apparatus and firefighters. In 1988 a push for additional stations resulted in the completion of six additional stations. In 2011 work began on remodeling station 5-3 and station 5-7 by means of district funds and federal grants. The first separate building for administration and a training campus was completed in 1996 at a cost of $1.7 million; it did not include response apparatus. This site became the new District Headquarters and remains so today. It has been developed to include training props for vehicle extrication, trench and confined space technical rescue, shore side rescue, ventilation, and forcible entry. First aid kits were first placed on fire apparatus in 1974. Ambulance transports were initially provided by Peninsula ambulance. In the 1980’s, pre-hospital emergency care at Gig Harbor expanded to include paramedics and the transport of patients. The first Gig Harbor Ambulance, A-1, a 1988 Wheeled Coach, was purchased by means of a donation from “Doc” Weathers. Paul Berlin, who would eventually become the Division Chief of EMS, was the first Paramedic for Gig Harbor Fire & Medic One in 1989. Gig Harbor was the second Pierce County Fire Department to offer transport services. Volunteer & Career Firefighters Gig Harbor fire district covers 54 square miles with 59.2 miles of shoreline. When Gig Harbor Fire began answering emergency calls, only a handful of dedicated volunteers served the communities calls for help and assistance. In January 1973, the first paid personnel were hired; Drew Wingard as Fire Chief, and Glen Stenbak as Assistant Chief. 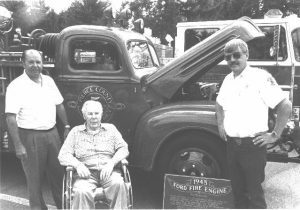 Beginning in March of 1974, the first three paid firefighters began working 24 hour shifts; Bob Copeland, Larry Claiborne and Chris Goodman. Today, the District employs more than 100 paid employees and is still served by volunteers from our community. Alarms during the early 1970’s equaled about 300 and included mostly fire-related and minor EMS calls. In 1999, Pierce County Fire District 5 responded to 2,060 medical aid requests, 178 fire requests and 452 requests for other types of service. In 2001, the total number of alarms exceeded 3,800. In 2016, members responded to over 5,500 incidents. Responding as a community of neighbors has changed to local station responses and in the late 1990’s became a three-battalion regional concept for response and training. With these changes, emergency responder roles have also changed. Gig Harbor has nine response stations, five of which are staffed by career Firefighter-EMTs and Firefighter-Paramedics. The other four stations are volunteer stations and house Resident Firefighters, with Firefighters and Volunteer Medical Responders also responding from them. Apparatus include nine engines, three medic units, a Battalion Chief vehicle, three water tenders, and other vehicles, including air-truck, brush-truck, rescue engine, and hazmat. We appreciate the continued support of our citizens.